Grab Bars and Safety Accessories - Does Miracle Method Install Grab Bars and Handicap Accessories? Whether recovering from an injury, or trying to prevent one, grab bars and bath safety products are key to providing the safety and security in the most dangerous room in the house, which is the bathroom. 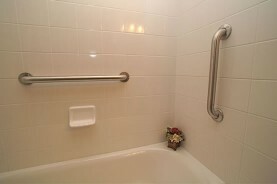 Miracle Method professionals can install grab bars, curved shower rods and hand held shower nozzles. These are must have items for every senior living at home or anyone who has limited mobility. Using ADA placement guidelines and the finest home healthcare accessories, homeowners and caregivers can feel confident and secure with Miracle Method’s installation of these bathroom safety items. Our goal is to provide a safer bathroom environment for our elderly customers, which will allow them to stay independent and live in their own homes longer. To learn more about grab bar installation options, click on Find a Location or call our toll free locator number, 1-888-271-7690 to reach the nearest Miracle Method professional.